A large chunk of my Ph.D. research is now out in the journal Sedimentology (you can find it here). The following post is meant to be a general summary of this work for a broader audience and will skip over many details and try not to use too much jargon (if you are interested in the nitty-gritty please see the paper or inquire below). What is a Depositional Slope? From the title of this post you might be wondering what I mean by the term depositional slope. All this means is that there is a sloping surface that is net-depositional over time … that is, sediment is accumulating on a slope such that the system builds out over time. This doesn’t meant that there is absolutely no erosion of the slope or no bypass of sediment down the slope, but over long time scales (>thousands to tens of thousands of years) there is net accumulation. One might argue that every depositional surface on the Earth is a slope – that there are few truly flat surfaces. This is true. However, the term ‘depositional slope’ generally refers to relatively steep slopes – about 2 to 4 degrees. That’s right … 2 to 4 degrees is steep! I know it doesn’t sound steep, but remember we are talking about slopes where sediment accumulates. Most depositional surfaces are fractions of a degree*. Steeper slopes on the Earth surface are typically net-erosional over time (e.g., mountainsides). Additionally, what I’m referring to is a large-scale depositional system (several to 10s of km in length). At a bedform- or sometimes delta front-scale, depositional slopes can be as steep as the angle of repose (30-35 degrees). Depositional slope systems develop in various tectonic environments and under various conditions. For this post, I will focus on a large delta-fed slope system that developed in a deep-marine basin in the latest Cretaceous (~75 million yrs ago). The study area for this research is a district in southernmost Chile called Ultima Esperanza. For a summary of this part of Patagonia read this post first and then come back here. It outlines the regional geography, the tectonic context, and discusses the specific mountain where we did this work, which is called Cerro Divisadero. It should be at least skimmed before going further. The important contextual geological aspects to remember about the Magallanes Basin from that post is that: (1) it was a relatively narrow (10s to 100 km) foreland basin associated with an active volcanic arc and adjacent to an active fold-thrust belt, and (2) a large-scale delta system filled in this elongate basin over ~20 million year period. What is So Special About These Rocks? Why go to the “end of the Earth” to study some sedimentary rocks? What is unique about the geology in this location? First, and perhaps simplest to explain, is that there had been only a few sedimentary studies published on this formation, called the Tres Pasos Formation, before my work. The work that did precede us was very good and provided an important framework on which to build. From a sedimentological point of view, research conducted by the Univ. of Wisconsin-Madison faculty and students in the 1970s is notable. I’ve since corresponded with a person who did some of that work and it’s been a joy to hear the field stories from that time. Additionally, a colleague from my alma mater who preceded me by a few years did the first investigation of the Tres Pasos on this particular mountain. Foreland fold-thrust belts and their adjacent foreland sedimentary basins typically evolve in such a way that basinal deposits end up being incorporated into the orogenic belt as the system migrates. That is, the sedimentary deposits are eventually uplifted into mountains and thus exposed at the surface as outcrops. As a result, outcrops of foreland basin deposits are relatively common compared to other tectonic settings (e.g., passive margins). But, what makes the Magallanes Basin unique is its heritage before it was a foreland basin. Prior to this phase, the basin was an extensional (back-arc) basin — with oceanic crust and everything. That extensional basin then evolved into a compressional (foreland) basin. This basin opened up and deepened to the south. Retro-arc foreland basins (or, basins ‘behind’ an active continental arc) generally do not develop long-lived deep-marine sedimentation. 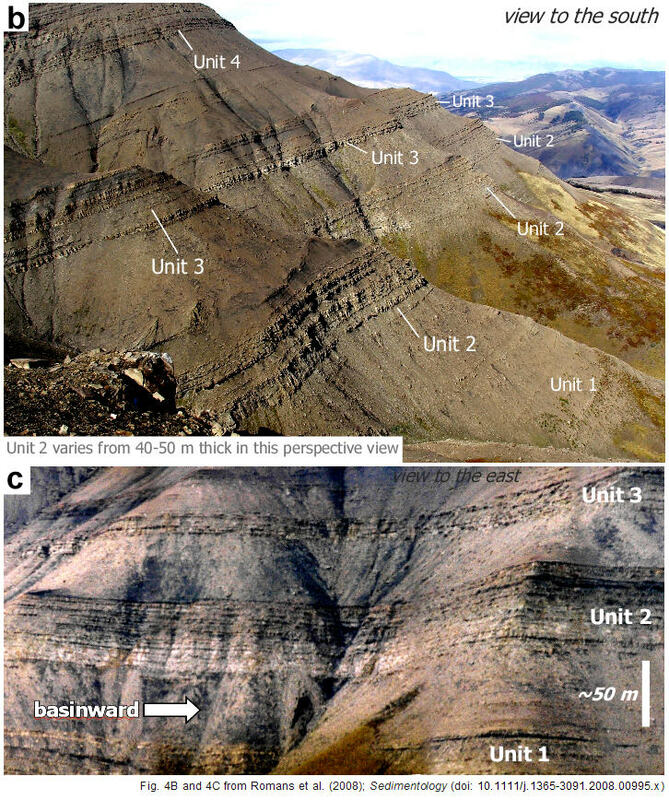 You should read the paper for more of the context, but to make a long story short: outcrops of the Magallanes Basin beautifully display a thick succession (>4,000 m thick) of deep-marine deposits across a large area. The Tres Pasos Formation represents the upper 1,000-1,500 m of that deep-marine fill. What Was the Objective and What Kind of Data Was Collected? One of the primary objectives of this research was to characterize this stratigraphic succession in great detail. The data from this characterization, which I’ll outline below, is then used to “read” the history of sedimentation. The sedimentary record is a book – the strata represent conditions on the Earth’s surface through time. Observations and measurements of the rocks lead to interpretations of processes of deposition, which help reconstruct ancient Earth conditions. Sedimentologic and stratigraphic analysis of natural systems requires abundant observation. Unlike experimental approaches that aim to control or isolate conditions and answer very specific questions regarding process (e.g., flume or tank experiments), characterizing the products of nature requires assigning relative significance to myriad observable features and then interpreting them. The photos below (part of a figure in the paper) will hopefully give you a general sense of the rocks. The exposure is spectacular! The strata on this mountain, called Cerro Divisadero, is dipping to the east (to the left on the photo) about 20-30 degrees on average. There are some localized small-scale faults and associated drag folds and there are also some Miocene igneous intrusions (related to the magmatic event that created this nearby feature) to be aware of, but all-in-all the Cretaceous sedimentary rocks are beautifully preserved and on display. In a very general sense, there are two basic rock types here – sandstone and siltstone. In the photos above the sandstone-rich sections are lighter in color and more resistant whereas the siltstone intervals are darker and more commonly covered in talus. Note that the sandstone-rich packages, which range from 20-70 m in thickness, are labeled Units 1-4. I will come back to these later. These two general groupings of rock types are then further subdivided into more specific groupings (termed ‘facies’) based on observable characteristics. I won’t go into all of this here, you can read the paper, but determining the breakdown of facies in sedimentary analysis is not trivial. During data collection this process is typically iterative and can change as new information is gathered. One of the fundamental (and classic) methods for capturing information from a sedimentary succession is to simply measure a vertical section. Measured sections come in all types, styles, and scales – they should suit the objectives of the study. In this case, we described the strata on sections capturing centimeter- to decimeter-scale features (depending on the rocks and your goal you may go for higher or lower resolution). The vertical axis is thickness and the horizontal axis is grain size (see example at left; click on for larger view). For these strata, grain size captures the general rock types. Superimposed on this framework is additional information, such as bedding contacts, sedimentary structures (e.g., cross-bedding), occurrence of biogenic features, paleocurrent indicators, and so on. The result is a profile that nicely documents the vertical changes in the succession. I measured a total of ~1,800 m of rock from numerous sections across the study area (>600 m thick by 2.5 km across). I did this over two separate field seasons (2005 and 2006) with the help of four hard-working colleagues. If you’ve been reading this blog for a while, you already know where my research interests lie — turbidites. By using the term ‘turbidites’ (i.e., deposits of turbidity currents) I’m lumping together various types of sediment gravity flow deposits. If you know nothing about turbidity currents, picture a mixture of sand, silt, mud, and water flowing down a submarine slope (loosely similar to an avalanche). Check out some web resources about turbidity currents here. This entire 600 m-thick succession is dominated by various types of turbidites and other gravity flow deposits. To capture the lateral relationships between the vertical sections, we walked out beds and mapped out the changes on photomosaics in the field. In some places we simply couldn’t get across safely (e.g., a steep cliff) so we used the photomosaics in concert with binoculars to observe and document the relationships. To depict these relationships, I created diagrams for a couple of the sandstone-rich units that show the measured sections and how they correlate. The example below is just for Unit 2, which is about 40-50 m thick. 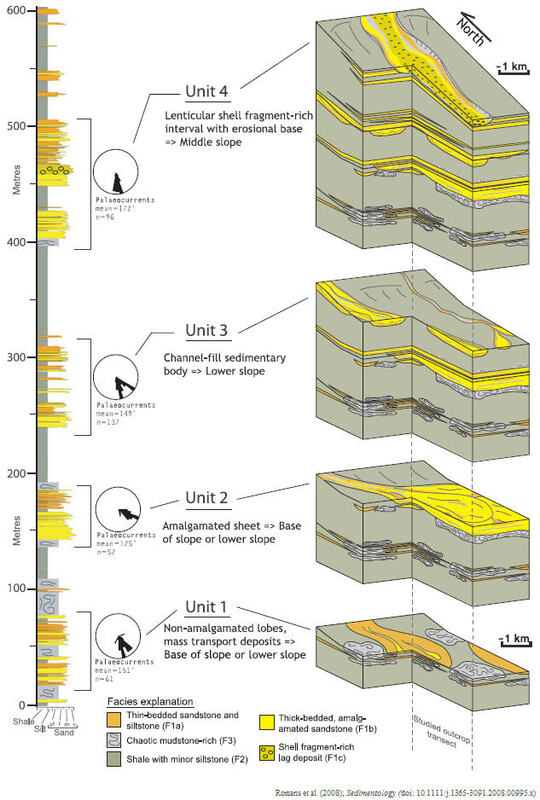 The studied transect (2.5 km across) is basically a 2-D slice through the stratigraphy. At smaller scales, the gully and ridge topography of the mountainside produces some three dimensionality (look at the very top photograph above). Appreciating 3-D complexity of stratigraphy from largely 2-D outcrops is always a challenge. But, on the other hand, while full 3-D imaging of the subsurface reveals larger-scale context, it cannot “see” the detail that outcrops provide. I could go on about the data collection, methods, and process interpretation but I will spare you. Please see the paper for more details. One of the biggest challenges in a science that describes and characterizes nature’s complexity is synthesizing all the information. Summarizing my interpretations of this 600 m-thick pile of sedimentary rock is accomplished in the text of the paper — and with a summary figure. Deciding how to depict all the relevant and significant information in one illustration is crucial (and not always easy). 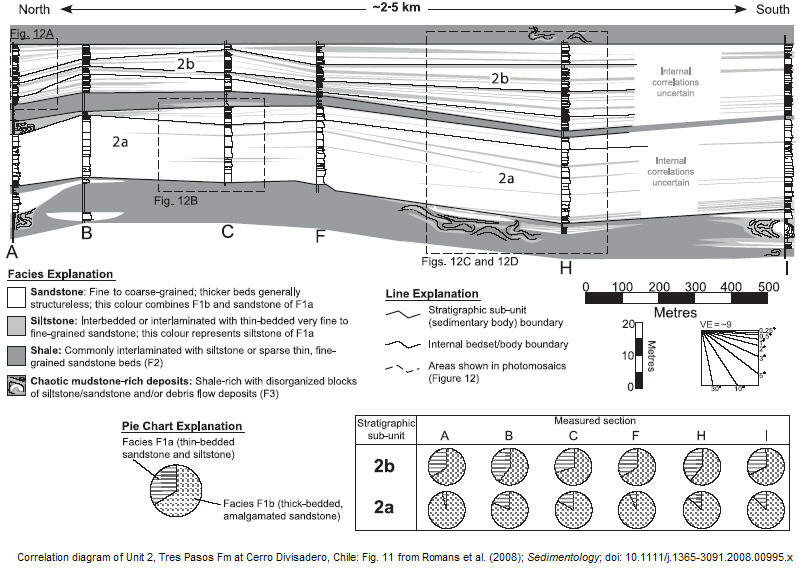 The summary figure (below) shows a type measured section on the left with simplified sketch block diagrams of how I interpret the depositional environments at right. In the block diagrams the studied transect is depicted in the cut-out part of the diagram and honors the data/observations. The rest is interpretive. The yellow and orange colors represent thick- and thin-bedded sandstone, respectively, and the grays are siltstone/shale. Note the four sandstone-rich units (cleverly named Units 1-4) that you can see in the overview photographs above. The sandstone packages are exposed much better than the finer-grained intervals and were the focus of a lot of the detailed work. The overall pattern that emerges is a systematic increase in sediment bypass upwards through the four units. What I mean by ‘bypass’ is that there are features in the rocks that indicate turbidity currents passed by this area and deposited somewhere down system. Evidence for erosion is a key indicator. If you look at the summary figure above, Unit 1 is dominated by relatively thinner-bedded and laterally continuous deposits, Unit 2 has some internal erosion but is still largely depositional, Unit 3 has a channel complex at its base (showing several meters of erosional relief), and Unit 4 has significant erosion combined with the coarsest grain size (very coarse sand with shell fragments) seen in this area. An analysis of the internal architecture of each of these units reveals a lot of interesting complexity, but when the entire succession is considered, the pattern I discuss above is robust. So, that is the interpretation of the stratigraphic evolution — or, how the nature of the strata change upwards through a succession. What does that pattern mean? We’ve interpreted this pattern to reflect the building out of this large-scale depositional slope. As the system accreted basinward over time, the nature of the depositional slope at this one site changed. In this case, the increase in erosion/bypass reflects a steepening of the depositional slope over time (note how that’s depicted in summary figure above). This is an interpretation and is consistent with what we know about this formation and the overlying formation in the region but is still just an interpretation. I’d be happy to entertain additional ideas on what this pattern represents, but I would ask that you first review the paper as there is a lot more data presented in there than what I’ve discussed in this blog post. This is a fair question and something all researchers need to ask themselves constantly throughout the course of a research project. The answer falls under two general categories, one that is scientific and one that is applied. 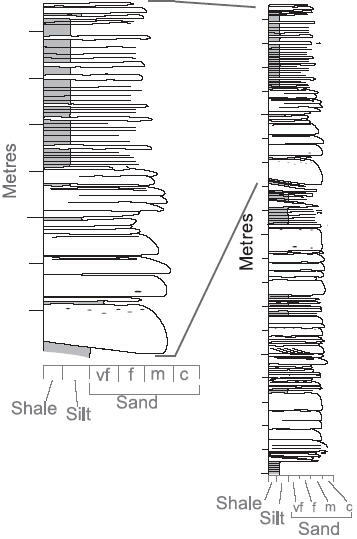 As I laid out in the beginning of the post, the Magallanes retroarc foreland basin is unique in that it has such a thick (>4,000 m) deep-marine/turbidite fill^. The Tres Pasos Formation represents the upper part of that fill and is overlain by a deltaic formation. Other outcrops of delta-fed depositional slopes discussed in the literature (e.g., Eocene of Spitsbergen, Cretaceous of Wyoming, Permian of South Africa) are smaller systems that developed in basins on continental crust. The back-arc basin heritage of the Magallanes Basin permitted enhanced subsidence and a larger-relief system from delta to basin (at least 1,000 m water depth). This is important because conceptual models of depositional slope systems are significantly influenced by outcrop characterization studies. Although the research I’ve summarized here is from one system, I would argue that it is an important system to consider because of its scale. Passive continental margins (e.g., Atlantic United States, west Africa) very rarely get uplifted and preserved in outcrops — and when they do they can be severely deformed (since they were involved in the closure of an oceanic basin). While the Magallanes Basin is certainly not analogous to a passive margin, the scale of the slope system is significant and may share characteristics with continental margins. In terms of application, conceptual models of stratigraphic evolution are used in oil exploration and development. Sandstone packages similar to the ones on display at Cerro Divisadero are important reservoirs around the world. Outcrop studies like this are used as analogs for better understanding the complexity of these types of deposits. * An important caveat here is that I’m talking about siliciclastic slopes – depositional slopes in carbonate systems are a completely different story. Some carbonate platforms can have essentially vertical slopes. ^ Pro- or peripheral foreland basins typically have thick deep-marine sedimentary fills but can also be quite structurally deformed and thus difficult to reconstruct in detail over large areas. Very nice, and congrats on the publication in Sedimentology! I see that the units vary moderately in thickness – especially some of them. If these beds were somehow repeated by imbricate thrusting or some other complication (sometime in the far future), do you think you could tell which sandstone section or sections you were in because of the overall characteristics of the beds? Would microfossils be required to do this feat of correlation? How far along strike or downdip do you think these types of beds could be correlated if they were broken up or repeated? And do sandstone-mudstone turbidite sequences ever get mixed up with limestone beds, with limestones somehow being part of the sequences? Just curious! I met a person recently who never wants to hear the word turbidite again – can you believe it? very informative post and great figures too . and thanks for making the distinction between siliciclastic depositional slopes and those in carbonate systems! In some places we simply couldn’t get across safely (e.g., a steep cliff) so we used the photomosaics in concert with binoculars to observe and document the relationships. Brian do you think in the future applications like Google earth with terrain (3D tilt) may help in doing a pre-fieldwork rough guide to stratal relationships? Silver Fox … great questions … I’ll try and answer them. Most likely not. Unless there was some marker bed/horizon w/ very unique features or geochemistry or something. There are some areas in this outcrop belt where there is some repetition and it’s recognized by mapping the fault itself. The throw is minor (10-20 m) so arguing that the succession is repeated is believable. That would be nice … but, the time between sandstone-rich units would probably have to be fairly significant such that different biozones are represented. Turbiditic successions can pile up relatively rapidly thus generating a rather thick succession all within a single biozone. Additionally, the preservation of microfossils in turbidites is highly variable. In this particular area, on top of all that, the nearby Miocene magmatic event cooked the forams ever so slightly such that recognition of different species is problematic. In this particular formation, one doesn’t not have to go very far to see big changes. In some cases, a couple hundred meters … at most a couple kilometers. These sandstone bodies are highly lenticular and variable over short distances. In other settings, where the beds go for several to 10s of km, the ability to correlate single beds goes up. For example, the Marnoso-Arenacea outcrops in Italy are interpreted to represent a “basin plain” environment and some individual beds can be correlated for 20-30 km (according to some workers). Yes, although it’s typically over thicker intervals (alternating at scales of 100s of meters) … I’m not sure if I’ve seen a succession where carbonates and siliclastics alternate bed by bed. Maybe some other readers have. Hopefully that addressed your questions … let me know if not. Yes, I hope so. We are using GoogleEarth in area south of here to help with big-scale relationships, but I would LOVE to be able to see bed-scale resolution. Some researchers have done stuff w/ LIDAR and/or draping high-res photomosaics on DEMs and such. Thanks Brian, great answers. I wasn’t finding anything in the literature, then suddenly you posted! Are you at all familiar with the late Palezoic stratigraphy in Nevada, btw? If so, I might email you. Silver Fox … the only experience I have with the Late Palezoic in Nevada was helping out another student some years back sample across the P-T boundary (very near the Oregon border). That’s it … sorry.